Regardless of your grade as a student of Social Studies you will be required to produce different types of writing: Persuasive essays, comparative essays, source and data analysis, research reports, investigations, empathetic pieces, letters and opinions. Different types of writing require different types of skills and you will always be given the opportunity to practice these skills thoroughly before any assignment or assessment. To help you to become proficient I will provide you with "How to (comparative essay, etc.)" handouts, graphic organizers examples and easy to understand rubrics. For some examples please see below. Han China and the Roman Empire were politically similar in that they both had strong armies and were ruled by an Emperor but, they had very different structures to their governments. ‘Merchants were considered to be lower than peasants in Han China as they did not produce anything and merely made a living from the work of others. As Farah-Karls states, ‘Chinese society viewed merchants with contempt despite the vast wealth they accumulated. Confucianism taught that the pursuit of profit was unworthy of for the “superior” individual.’ (Farah-Karls pp.229) Thus Confucianism helps to explain why merchants were held with such low regard in Han China compared to their position in Roman society. Before sitting down and actually writing your essay it is always advisable that you organize your thoughts. In History you may often be asked to compare, evaluate, analyse different civilizations, causes and effects, different events and other topics. Graphic organizers can be very helpful in helping you to do this. Attached below is an example of a PERSIAN chart and how it can be used to answer an essay question. The Freyer Model is a graphic organizer – an effective way to teach vocabulary at all grade levels. My students complete a Freyer Model for every vocabulary word we are learning, showing their understanding both linguistically and non-linguistically. There are five parts to this graphic organizer. 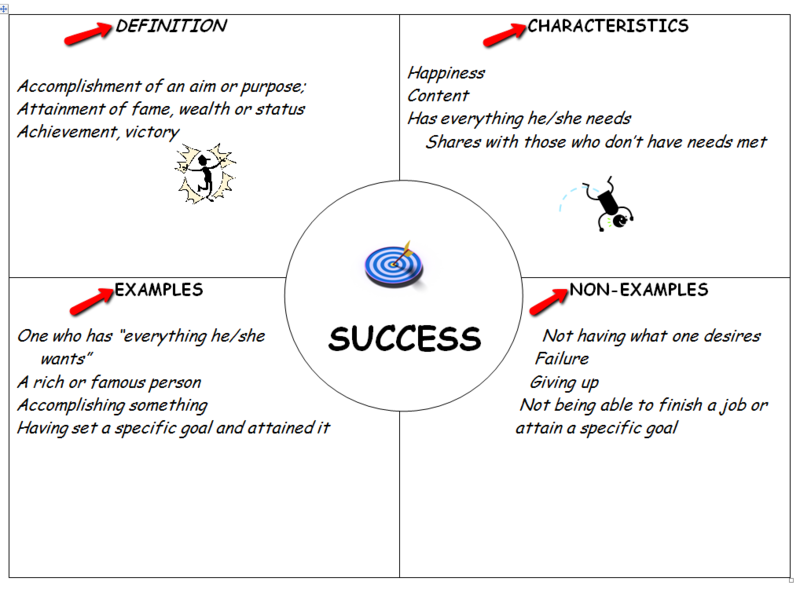 In the middle of the graphic organizer, in the circle, students enter their vocabulary word, e.g. cat. Then, students write the definition of their vocabulary word in the upper left hand box, e.g. a small domesticated carnivore. In the upper right hand corner box, students write characteristics that come to mind about this word, e.g. furry, friendly, kittens, etc. As you get older you will be required to write analytical essays which can quite daunting for some students. I will assist as much as I can and will provide you with a basic formulaic essay format you can use as a guide to writing your essays. once you are comfortable writing essays you can move away from the formula and begin to develop your own style.